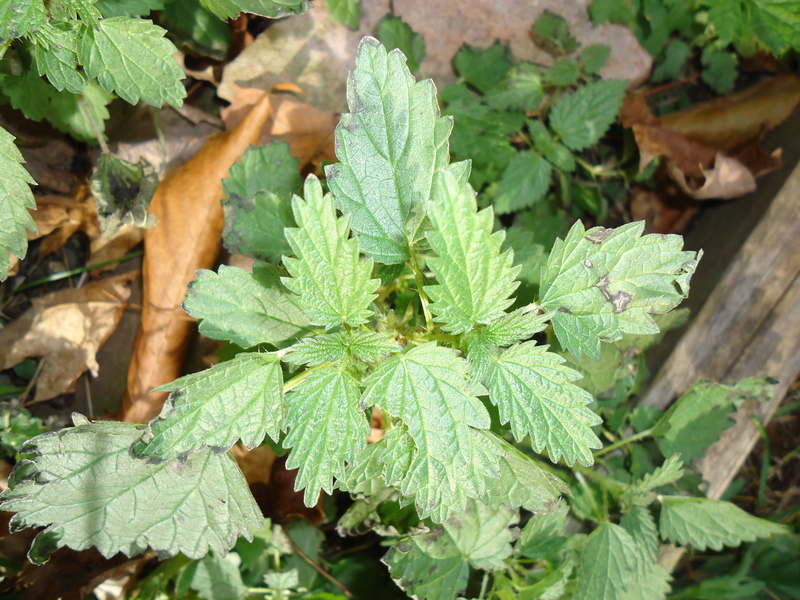 Nettles are my favorite healing herb. This fact about me is something I do not hide. Now I have plenty of other herb friends, both cultivated and wild, that run a semi-close second in my favorite herb department. Nettles are #1! In the above picture you are looking at the beautiful tiny seeds that dangle in strands from the nettle plant. These seeds are powerhouses of nutrition for nourishing thyroid health. The dose is 1/4 teaspoon daily. I would take this as 1/8 teaspoon, twice daily. To dry nettle seeds I cut the entire stalk at the base and hang them upside down in a warm and dry space. Make certain you have a screen or something similar underneath the hanging plants to catch any falling seeds. When they start to dry, I carefully cut each strand from the stalks. I put them in a paper bag, poked with a knife to make many air holes, and hang the bag to completely dry the seeds. Leave the top of the bag wide open for better air flow. You can also use a very fine mesh bag to hang and dry the seeds. The remaining stalks can be left to dry out the leaves. Again, trim the completely dried leaves off the stalks and store them in an air tight container. You now have dried nettle leaves for adding to soups, stews, sauces, and for making healing tea. The beautiful nettle plant displaying her seed strands. Looking straight down at the nettle plant. The seeds strands form a whorled pattern about this beautiful, healing plant. This is but a partial list of all the benefits nettles has in the human body. 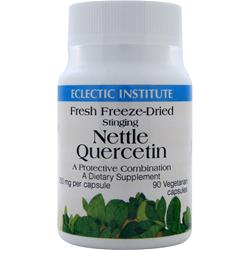 I suggest you become friends with nettles and learn all you can about her healing ways. What you are observing, below, is a chicken nettle salad sitting on top of a romaine lettuce, carrot, and cucumber salad. In the upper left corner is a big dose of my late spring, wild leek infused sauerkraut. I got carried away and made 8 quarts! 5 quarts down, 3 quarts left to enjoy! left over chicken breast from dinner at the ADK Cafe in Keene, NY. If you are ever passing through here, stop and eat. The food is divine, the meat is local and pasture raised! homemade mayonnaise made with 3 tablespoons whipped heavy cream, 1 small egg's yolk, and a dash of yellow mustard. I whipped the cream well, added in yolk and whipped some more, then added mustard. The cream and eggs were both from local, pasture raised animals cared for with love. The chicken was chopped up, mayo blended in, added in the chopped herbs and nettles, and stirred all together. I plopped this decadent chicken salad on top of my veggie salad (all local veggies from Martin's Farm Stand) that was dressed with my homemade herb vinegar dressing. The finishing touch: wild leek sauerkraut! Eat healthy, eat whole... your body cells with thrive with vibrant, radiant health! 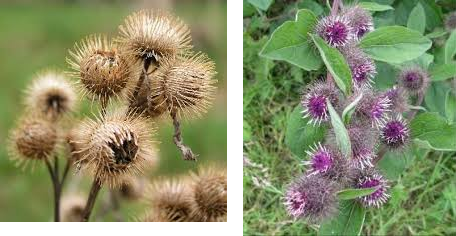 Ah, burdock, that annoying plant that sticks those prickly balls on clothing after a romp in the woods and fields. This plant, that creates burr seeds, is a healing blessing, despite those barbed 'lil balls! As a kid, I fell into a large clump of burdock plants while romping in the fields. Those burrs make an amazing mess in long hair! Surprisingly, as an adult, I do not avoid them. Burdock can be utilized in a number of herbal remedies to aid in digestion. 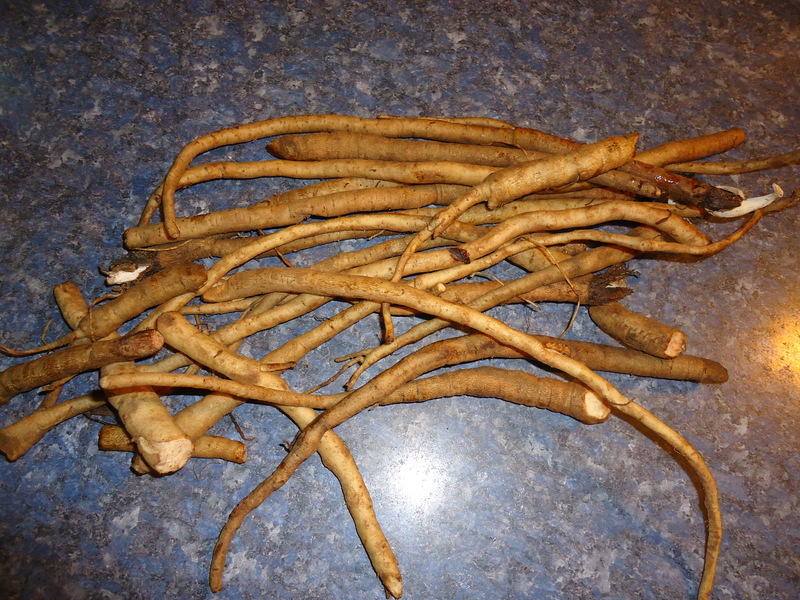 The root is bitter, stimulating the liver, and therefor aids in digestion, enhances absorption of nutrients, and supports your whole digestive tract and colon with the elimination of wastes. 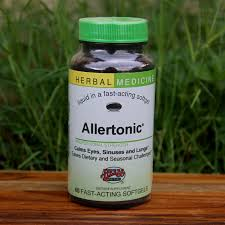 Burdock root, along with dandelion and nettle, are amazing, healing herbs to use in liver conditions. The liver plays a huge role in removing toxins from your blood, producing bile to digest dietary fats, metabolizing hormones to maintain hormone balance in your body, stores excess carbohydrates, in addition to many, many other functions. Why do I tell you this? I love burdock. 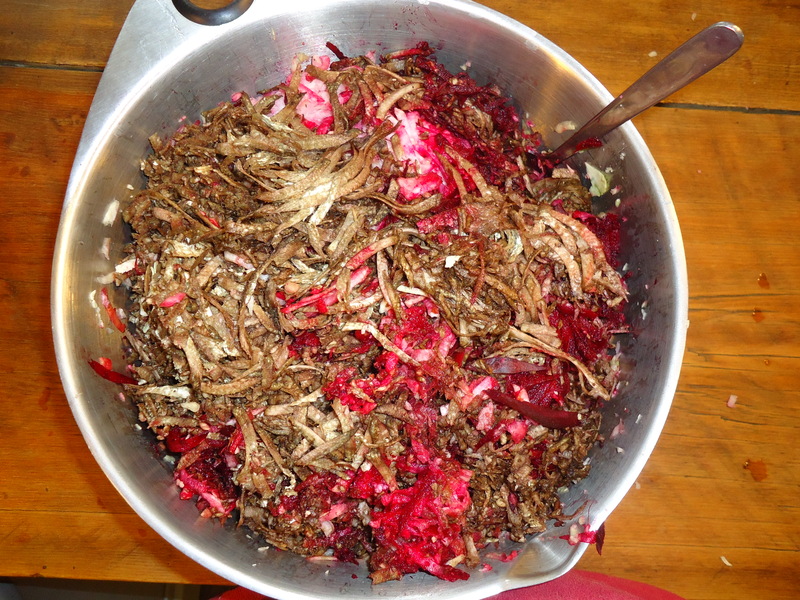 It makes a yummy tea, it is fun in soups and stews, and I just added a pile of it (grated) to my next batch of fermented veggies. I am curious to see what burdock will add to the final fermented product's flavor! The brown grated veggies on the top are burdock. This is a pile of burdock roots, graciously given to me by Dan Kent of Kent Family Growers. He knows I love burdock! I have used over half of my burdock gift already. My liver is feeling ready for spring and pollen season! On fermented veggies: I asked Steve, of The Cheese Maker, if cheese cultures could be used in enhancing the fermentation of veggies. This kind man did a 'lil research and got right back to me. Steve: I'll also do a little research and let you know what I find out. Steve: Hi Paula: Some research I found on Wikipedia and other scientific sites show that some of the same species of bacteria that make cheese are similar to those that make sauerkraut, though the sub species are different. I'm not a biologist, so I do not know how this will affect the flavor of the kraut. Only way is to make a small batch and see how it turns out. As long as the pH is similar in the end product, it is at least safe to eat. The below link is a culture which has similar bacteria, though not sub species. If you make a test batch, let me know what you find out. Me: I am posting to get other people's experiences, hopefully! Steve: Awesome. I would really like to hear from others who use this culture. I have enough hobbies otherwise I'd also make some kraut. Anyone ever used cheese cultures in veggie fermentation? 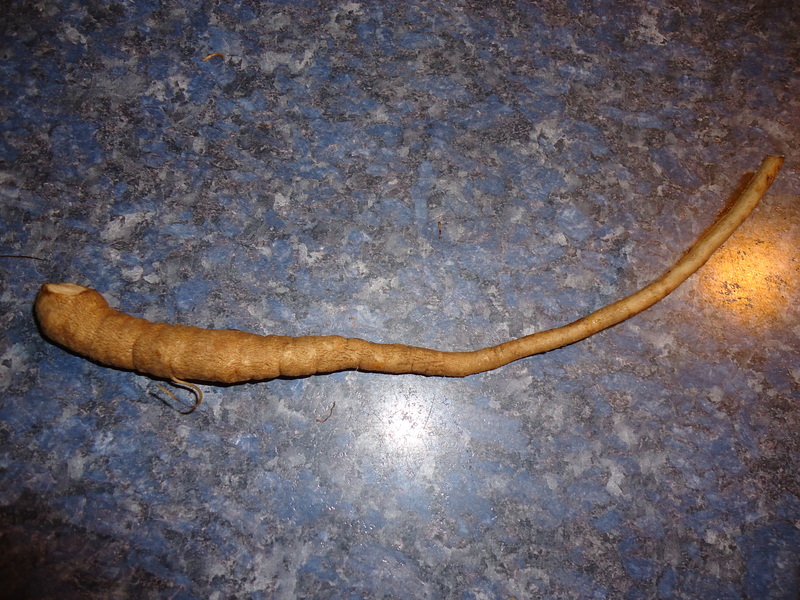 Anyone ever use burdock root in fermented veggies? Anyone know of a good source for veggie fermenting cultures?